In The Vineyard Self Catering Cottages - Klapmuts Accommodation. 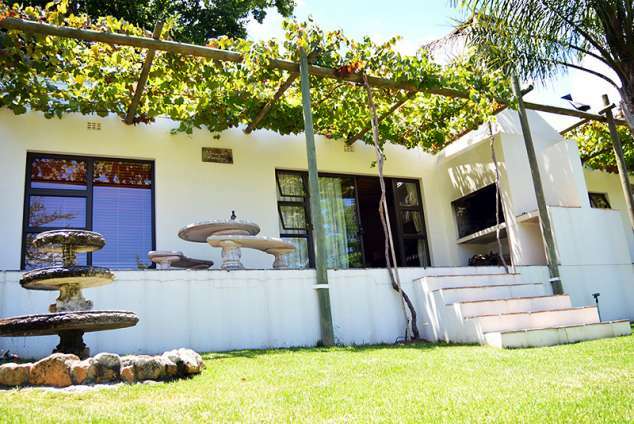 In the Vineyard cottages are situated on Uitkyk farm, a small family owned vineyard and olive farm, nestled at the foot of the Simonsberg mountains. We are surrounded by lush vineyards and stunning 360° scenery. While staying in one of our homely cottages, you will experience the feeling of a working farm, but will still enjoy the beauty and peace of nature that surrounds you. Centered between Paarl and only a 45 min. drive from the city of Cape Town, In the Vineyard takes you away from the busy city life and offers you relaxation and a home away from homes. Our two cottages, The Vineyard cottage and The Olive cottage each accommodates up to 5 people in 2 bedrooms, with your choice of a kingsize bed or two single beds in the room. We also have an additional double bed sleepercouch in the living area. We are child-friendly- your little ones can enjoy playing on a safe farmyard, with security fencing all around you. 38308 page views since 26 May, 2010. Last updated on 08 Jun, 2018.